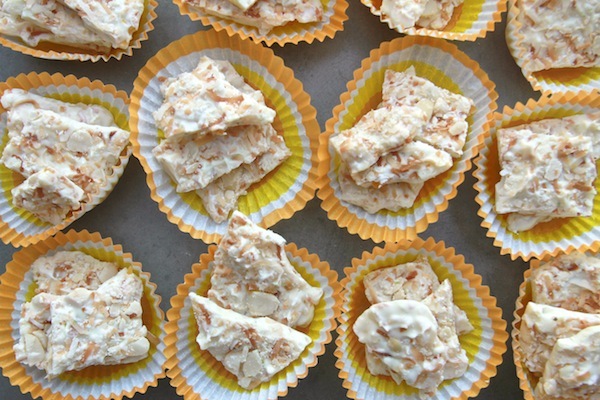 WANTED: A simple banana dessert that could easily pass as a snack or breakfast item. Must have a juicy caramelized layer because I’m looking to impress the internet. 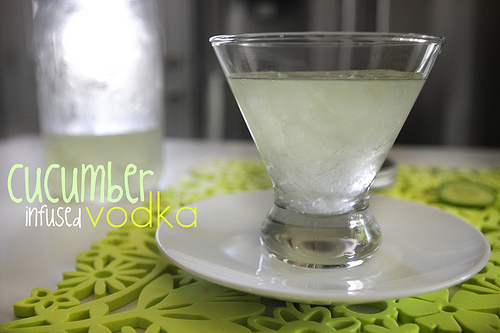 Bonus if you’re easy to make and require very few ingredients. I’m a working mom so it’s gotta be quick. Must be OK with toddler fingers poking at you and multiple chunks taken out of you by the hands of a greedy baker. 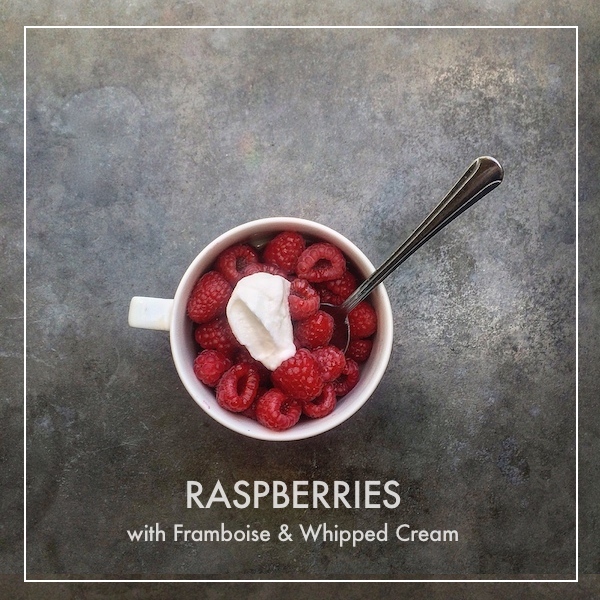 You must pair well with a dollop of Greek yogurt. Please don’t be too ridiculously sweet. If you’re up to the task, I’d love to talk to you. No weirdos please! Well…maybe. And oh boy was it good. 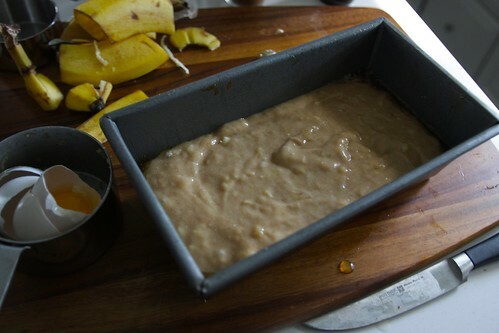 Take one of your bananas and measure it along the bottom of your loaf pan. 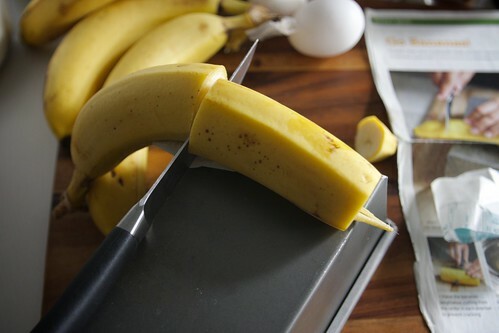 Cut the bananas to the size of the bottom & cut in half lengthwise—like this. Put sugar & water in a pan over medium heat until it becomes amber in color. Say HELLO to your butter and let it melt. 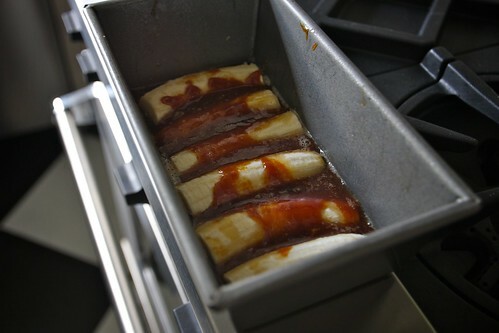 Now add in your bananas cut side down and cook for a minute. 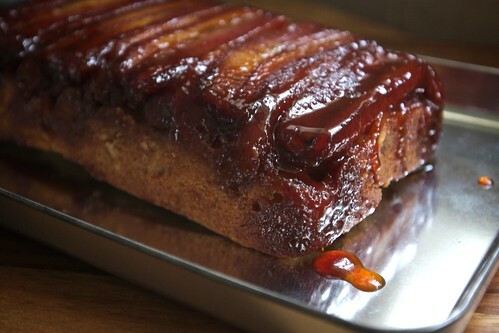 Transfer them to the bottom of the loaf and drizzle with the leftover caramel from the pan. Now it’s time to make the batter. 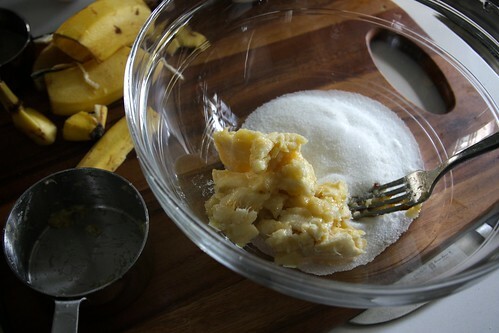 Mash together the bananas with the sugar. 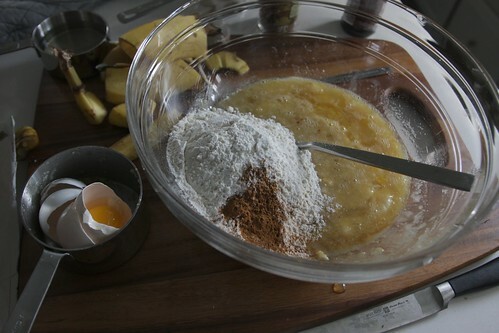 Add in the egg & egg white and the vanilla…and then add in your dry ingredients. I didn’t bother to use another bowl to mix the dry ingredients. I’m lazy. Add in the oil and MIX! Batter’s done! 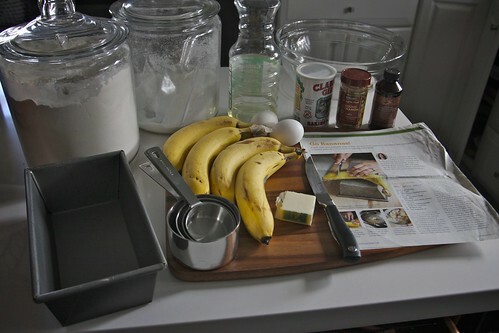 Pour the batter on top of the bananas. And off to the oven it goes! And out it comes…look at the caramel that came up to the top! NOM! Let it cool and then INVERT IT. Look at this. Aren’t you speechless??? While I have a little binge. Position a rack in the center of the oven and preheat at 325 F. Grease a 9 inch loaf pan. 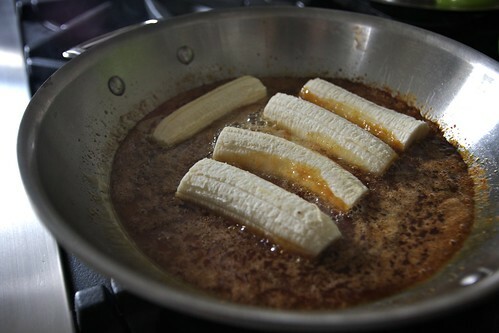 Trim both ends off each of the 3 bananas to fit crosswise in pan; reserve the ends. Halve the long banana pieces lengthwise; peel and set aside on a plate. 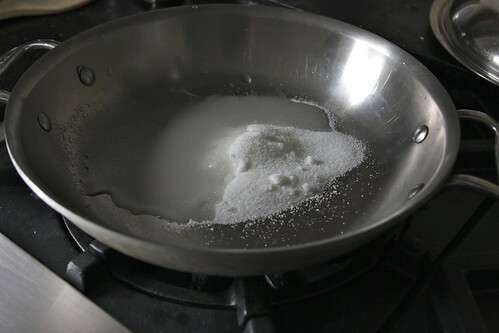 In a large skillet, bring 1/4 cup sugar and 2 tablespoons of water to a boil, without stirring. Cook until the water has evaporated and the mixture starts turning amber in color. 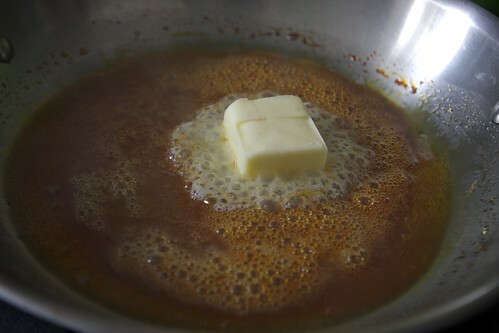 Remove from the heat and add the butter and swirl with a fork until melted. 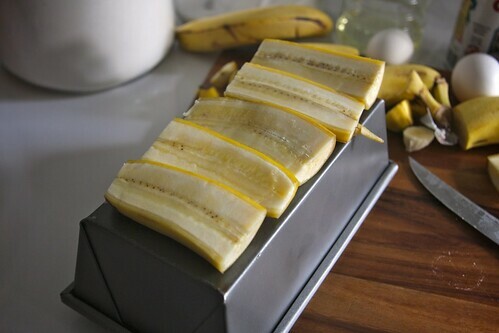 Add the long banana pieces cut side down and cook over low heat for 1 minute. Transfer the slices cut side down to the prepared loaf pan, arranging them crosswise. Drizzle the remaining caramel on top. 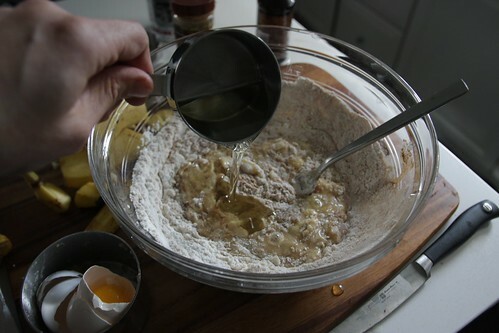 In a medium bowl, mash the banana end pieces to equal 1 cup (add more banana if necessary). Mash in the remaining 1/2 cup sugar. Beat in the egg and the egg white as well as the vanilla. In a large bowl, whisk the flour, baking powder, cinnamon and salt. Add the banana mixture and oil and stir until well combined. 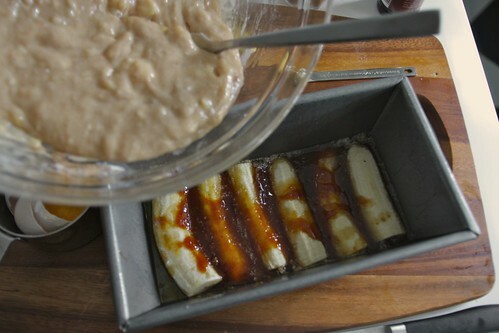 Pour the batter over the bananas in the pan and bake until a toothpick inserted comes out dry- 50 to 55 minutes. 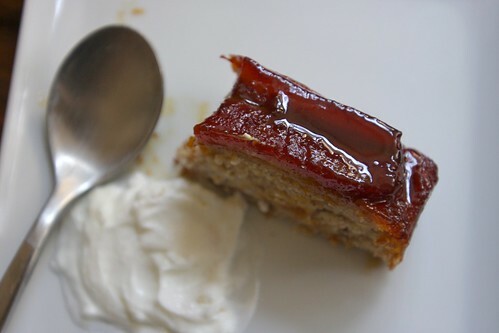 Let cool on a rack for 10 minutes, and carefully invert the cake onto a platter and let cool completely before serving. -I topped my loaf with a little sea salt. Twas tasty! Seriously?! Did you really just do this? I’m in love. You’ve done it again. I need this in my life. wonder if this would work with apples or plums for a bananaphobe like me? SWEET BABY JESUS!! uuummm, pineapple PLEASE, but man on man I am on this! At first glance I thought you were posting about ribs!! haha but this is much better! I have a question about the number of bananas. In the ingredients you say to use 3-4, and then lay them in the bottom of the skillet, but then you say to use 1 cup of mashed bananas. Are these mashed bananas included in the 3-4 estimate? Meaning use 2 bananas in the skillet, and 2 bananas in the batter? I think it really depends on how big your bananas are. 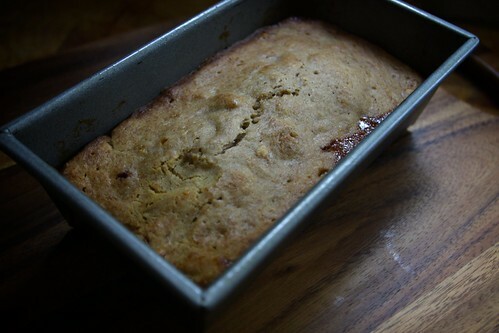 I ended up using two and almost 2 bananas for the bottom layer and then 2 in the batter. Pure evil genius. Something in me tells me I’d need a side of peanut butter for good measures. Bananas and caramel are two of my favorite things, and when they get together, my head explodes. WAAAANT. yeah. 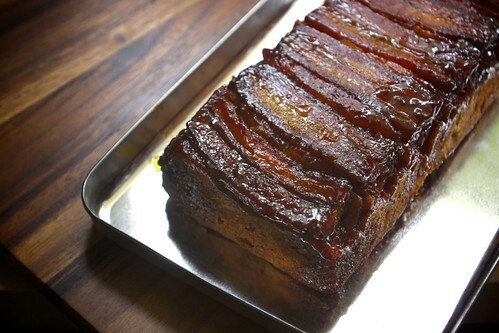 this is pretty much my dream and my worst nightmare all wrapped up into one sticky caramelized mess. i don’t know whether to thank you or spank you! Spank me! I deserve it. THANK YOU. Your randomness made my day. 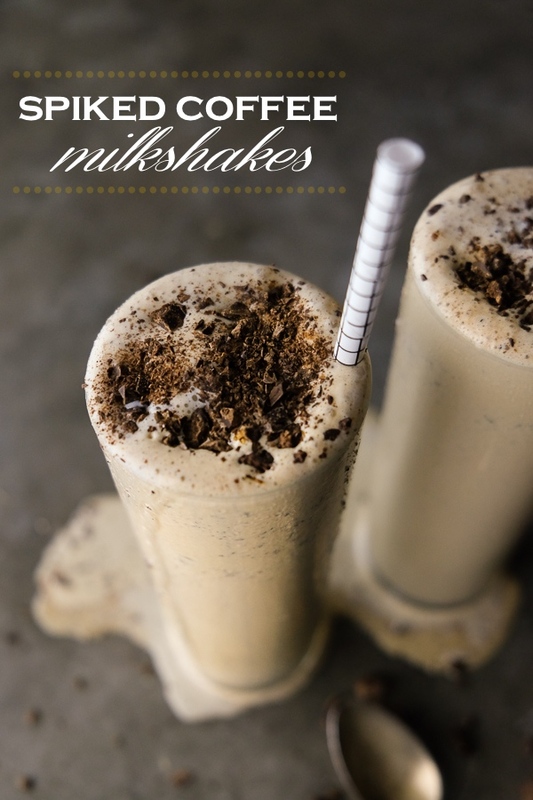 umm… delish! 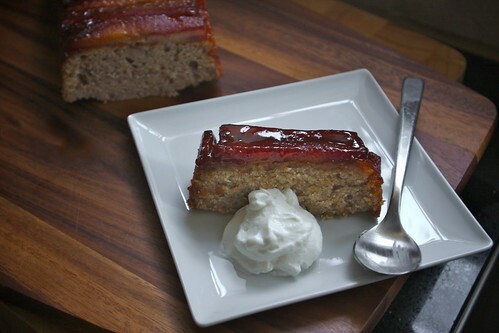 i’m salivating and will most definitely be making this banana-awesomeness this weekend. YUM! Fabulous! Love the idea of sprinkling a little sea salt on top. Well, you’ve impressed the internet, that’s for sure. 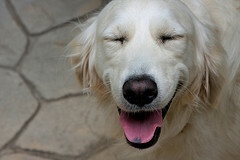 Caramel and what appears to be the snack of Zeus tends to do that. I’m going to be thinking about this for days. YUM! Made this last night, but instead of the veg oil, I chopped and pureed an apple with a splash of orange juice. (you can use applesauce too, I just didn’t have any) I used 1/2 cup of “applesauce” instead of 1/2 cup veg oil. SO DELICIOUS! Thanks so much for sharing! When you said “boil” the water and sugar, I took it literally, and it was totally the wrong consistency! hmmm. 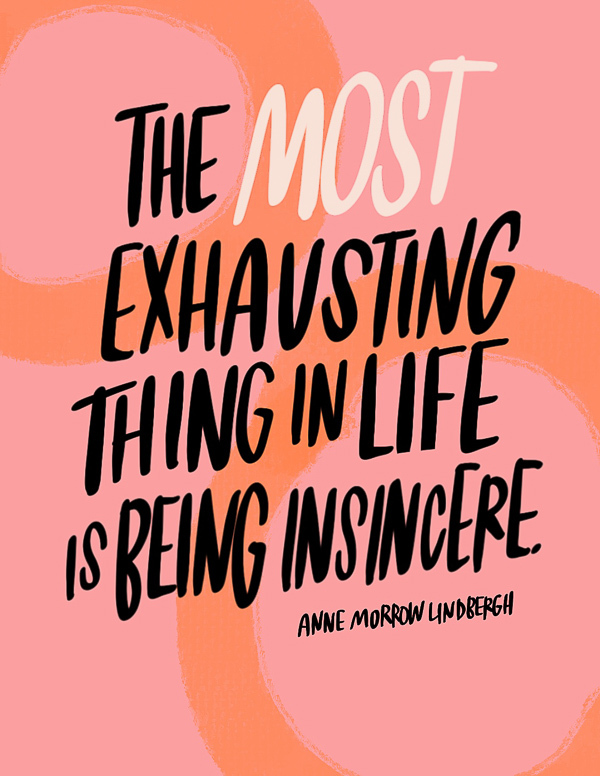 what consistency did you get? That is gorgeous! I’d love to have you link this up on my Saturdays with Rachael Ray series!! sure. Just tell me what you want me to do! oh no!!! you MUST keep your eyes on it!! it can burn in just a few seconds. I made this and it came out looking exactly like it! Sooo easy and turned out great!!! Thanks! I made this last night for a bake-off. I ended up eating half! 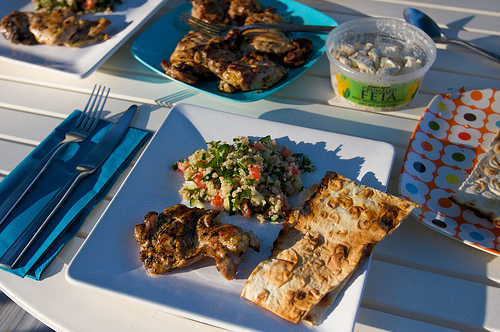 Great recipe will definitely be making it again! Hahaha! I can totally see why… Did you win? One Question though: When you refrigerate the leftovers, does the caramel harden and make it difficult to slice/eat for the next time? I made this today, using melted butter in place of oil, brown sugar instead of white, and made the addition of nutmeg, cloves, and bourbon. Also, i omitted the egg white and used just one egg. 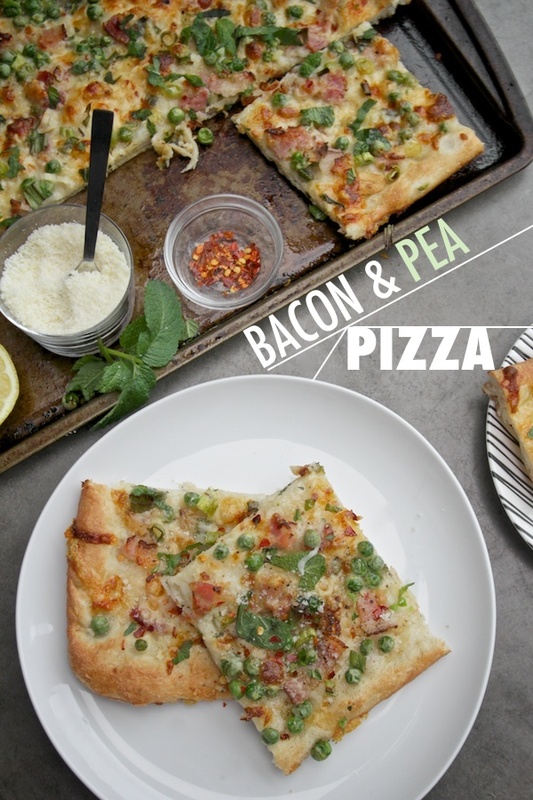 It turned out absolutely sinful, I’m so glad you posted this recipe!